Was born in 1941 in Frankfurt. She started writing haiku with the help of Dr. Tadao Araki, Fuyuo Usaki and Tohta Kaneko. In 1988 she founded the "Frankfurt Haiku Circle" and belongs to the board of the German Haiku Society. She is as well a teacher of Sogetsu Ikebana, which she studied in the course of many travels to Japan. 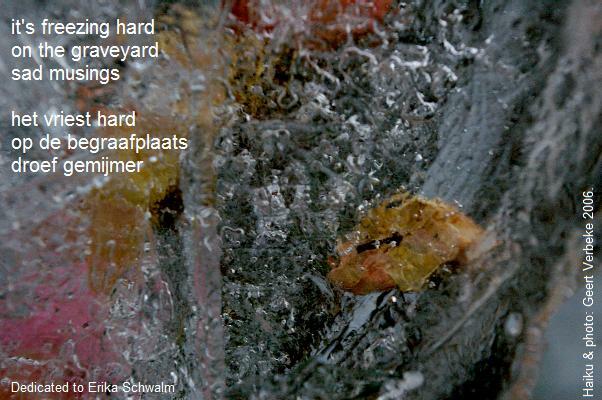 Her original way is connecting ikebana and haiku. 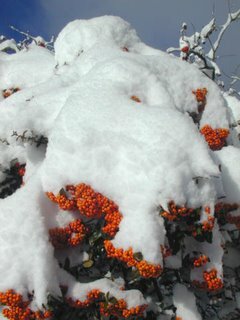 She has published two Ikebana books. 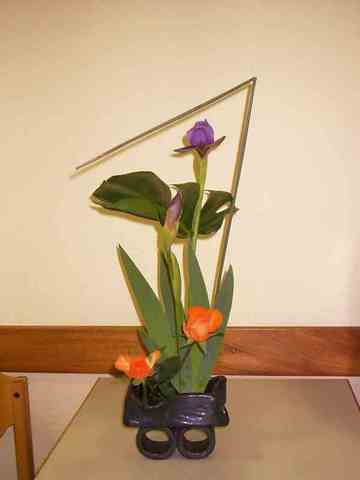 Erika is corresponding with ikebana and haiku-groups all over the world. Erika, you will live on in our hearts and haiku! Erika, I will miss you so much! We had already made plans for a meeting in Japan ! Mit groser Freude verfolge ich Deine Seiten im Netz und die intensive und geduldige Korrespondenz. Fuer all Deine Muhe mochte ich Dir herzlich danken. in the sadly universal way of things, i never told erika how much her presence on this list meant to me. erika was a haiku buff and an ikebana buff. the two arts are so much the same. take about eighteen inches from the end of a magnolia branch and trim away most of the leaves, leaving a branch with a few leaves that conveys the essence of what a magnolia is. is this not what we do with our haiku moments...scribble down the haiku moment and later, write a proto-haiku that captures the moment, then trim, trim trim until it is the essence of that haiku moment. erika, you live on in our hearts. and we will pass you on to others. a few years back i gave a talk on haiku to the sogetsu ikebana club here in dallas. (erika was sogetsu school). 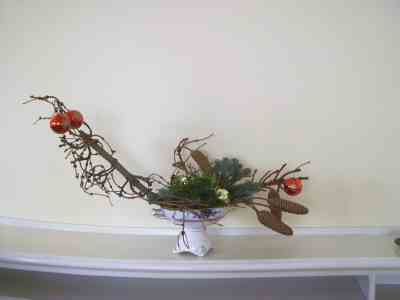 they told me that they were doing a 'linked form' of ikebana that day. each woman had brought a black 'container'. the leader brought common flowers to be included in each arrangement and each woman had brought some of her own choosing to add to her arrangement. a woman would make an arrangement and the next was to link to it and shift the next arrangement in another direction. 'why, that is an ikebana renga', i cried. it is so wonderful and rare to find someone who understands what you care about. Erika, ich werde dich nie vergessen! 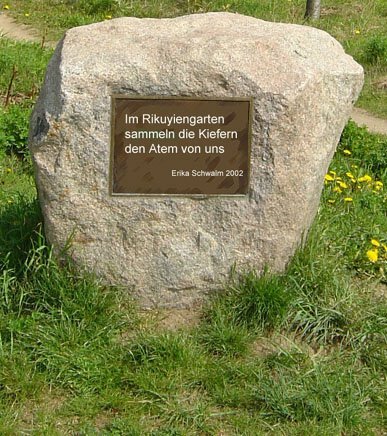 Im Oktober konnte ich sie in einem Seminar ihres Frankfurter Haiku-Kreis noch einmal treffen, sie war so voller Pläne und hat mir zwei Tage vor ihrem Tod sogar von ihrer geplanten Japanreise 2008 gemailt und mich gefragt, ob ich mir nicht überlegen wollte daran teilzunehmen. Unbegreiflich, dass sie uns so kurz darauf verlassen musste. Ich kann es noch gar nicht fassen! Eine Erinnerungs- und Gedenkseite für sie einzurichten, war eine sehr schöne Idee von dir. Ich habe ihren unermüdlichen Einsatz für das Haiku und die Menschen, die sich mit dieser Art der Dichtung beschäftigen immer bewundert. Sie wird eine sehr große Lücke hinterlassen. Das ist, was sich jetzt viele Menschen wünschen. We miss you so much our dear friend. We in Bulgaria organized a contest for the young translators of haiku from the German schools - "Erika SCHWAlLM". The students had to translate haiku by German and Bulgarian poets.In Yune 2006 the members of Bulgarian haiku club made a meeting with the winners in the 73 school - Sofia! The contest will continue in 2007 with translations of german, japanese,english and russian haiku. I wish to you many successes! You work so much and so perfect! 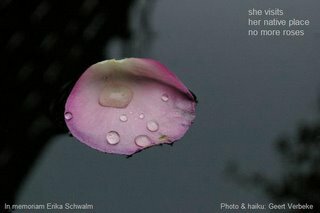 Erika was a very special person for the world haiku sociaty, for her German and foreign friends. Du bist einzelne, Erika-one extraordinary woman with so many interests and activities! I'd like to call myself your friend.